Tim Nodland of Nodland Cellars also works as a lawyer. He started making wine in 1999. The winery’s biggest seller is Bad Attitude, an entry-level red. Tim Nodland of Nodland Cellars has had a dizzying career track: From rock guitarist to talent agent to lawyer to winemaker. He still spends most of his days writing briefs and drafting motions as a civil litigation lawyer. Yet he has always needed a creative outlet. He used to hammer out power chords. Now, he hammers bungs into oak barrels. SR: Tell us about how you got interested in winemaking. Nodland: I started making wine in 1999. I had gone to a family reunion on one side of my family, and there were a bunch of people who had made wine. … Everybody was tasting the wine that they had made, and the wines were rough, but they were amazing in that … they had made them. I thought that was the coolest thing. … So I said I’ll get some cabernet, and I made one barrel of cab. It wasn’t too bad. That was in my driveway and barreled down in my furnace room. Next year we made three barrels of wine. The next year, we made five barrels. We had carboys in the kitchen, tanks in the family room. … It progressed until the house was completely taken over with wine. 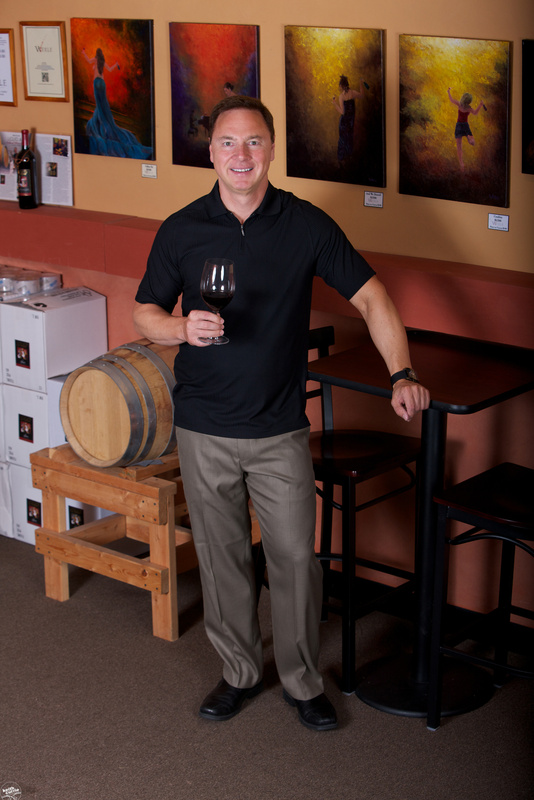 SR: How did Nodland Cellars come into being? Nodland: By 2005, I didn’t have a home anymore. I was living in a makeshift winery. So I rented a building and got a (commercial winemaking) bond. I went from 40 cases a year to 400 cases a year. I got contracts with the vineyards I liked the most, Seven Hills and Pepperbridge in Walla Walla. SR: How did you reconcile all of your other interests with winemaking? Nodland: I have career ADD. I was going to be lawyer since fourth grade. But when I was 17, I walked by a music store saw an electric guitar. And it changed my life. I took all my lawn-mowing money and had my parents co-sign. I practiced day and night and in two years, I was in a professional band down at WSU and I played every weekend. I put myself through college. I got out of school and all my friends got haircuts and real jobs in banks and IBM. I grew my hair long and got in a rock band and toured. It was called Fanatic. I’d been in probably a dozen bands. Then I got a job as a talent agent. … I had 18 hair bands on the road all over the country and I knew the business and I knew music and I was doing well. Then Kurt Cobain came along, and Soundgarden, and all of the sudden my hair bands were obsolete. SR: What about your law career? Nodland: I had just started law school (at Gonzaga Law School) because I wanted to be an A and R (artist and repertoire) rep for a record company. But record companies fell apart a few years after that. …I have been a lawyer for almost 23 years now. I’m still a full-time lawyer. Today, I came into the office at a quarter to eight, drafted some legal work, signed some motions, talked with clients, met with staff, had a meeting with the associate attorney, then I went out to the car, drove to the winery, put on jeans and boots and I punched down my cabernet franc and my petit verdot. SR: What is your most popular wine? Nodland: The biggest seller by far is Bad Attitude, an entry-level red. It’s an incredible value for the price. It’s a $40 wine for $15. SR: What is your personal favorite wine? Nodland: I love them all the same for different reasons, just like my children. The cabernet is from Pepperbridge Vineyard with (10 percent) petit verdot from Seven Hills Vineyard. It’s aged for two years in French oak barrels that cost $1,200 each. It’s a reserve; it’s the top. It’s a $100 wine that sells for $38. Another one that gets a lot of interest is one a lot of people haven’t heard of. It’s called carmenere. It’s one of the allowed Bordeaux varieties. They thought it was lost for 150 years. So I make a 100 percent carmenere, and people are just fascinated to drink a wine that is just like the lost grape of the ancient Romans. So that’s a fun thing I’m doing. I call it avant-garde – pushing the status quo and trying something new. SR: Do you think of winemaking as an art or as a science? Nodland: The French and Italians have been making great wine for centuries, for millennia, without any science. I didn’t understand the science anyway, so I put those books back in the box and I read about the art of wine. So I taught myself the art of it. And I do everything the old-fashioned way. Old-fashioned barrels, open-top fermenters. I’ve learned some science. But if you work with great vineyards and great grapes, you don’t need a lot of science. SR: Can you explain the philosophy of the winery in one sentence? Nodland: Art for art’s sake. I don’t make money at the winery. I have a job. The day the winery becomes a job, I quit – although my father says I spent seven years in college to buy myself a manual labor job.